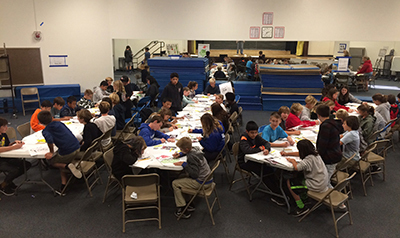 A carnival atmosphere focused on Halloween will pervade this family-friendly event where you and your children will be able to participate in creativity stations throughout the 6000 square foot Center. There will be mask-making, trick or treat bag and faux pumpkin decorating, “Day-of-the-Dead” skeleton head decorating, wire art, lyric-writing, toy-making, animation light-table drawing, and a stop-motion animation station where you’ll be able to make your own cartoon using some of Chuck Jones’s favorite characters like Bugs Bunny, Daffy Duck, Wile E. Coyote, and the Road Runner. Play It Forward, a FUNdraiser for Creativity, will be open from 1 to 4 PM on Sunday, October 22 at the Chuck Jones Center for Creativity, 3321 Hyland Ave., Suite A & B, Costa Mesa, Ca. Tickets are $50 per family, regardless of the number of members, and will include a “Mix-Your-Soft-Drink bar, Popcorn, and a Decorate Your Own Brownie station. Plus, there’ll be live music provided by Music Vault Academy! Tickets available at PIF4Creativity.org. Leigh Rubin, Creator of "Rubes", Appearing in Wisconsin! Moo! 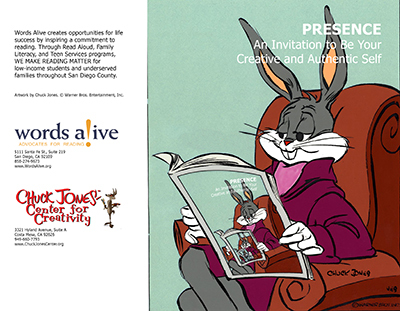 This is a big month for the Chuck Jones Center for Creativity!Along with our participation in this year’s Festival of Children—be sure to stop by on Saturday, September 9 between noon and 4 PM at the Carousel in South Coast Plaza—we’ll have a fun, easy creative activity in progress—we have a great opportunity to win a $50,000 grant from Festival of Children Foundation by participating in their NCAM Photobomb Challenge. But we need your help! Want to get extra CREATIVE? Use the Looney Tunes characters and/or backgrounds shown in this blog post to enhance your photobomb! Remember to include © Warner Bros. in your photo or video bomb if you do use these images. Linda Jones Clough continues to sort through her archive of memorabilia and ephemera to share with us. In this photo, taken in 1941 at Mammoth Lake, we find Chuck Jones, standing far right back row, with members of his Unit A taking a holiday at California's Mammoth Lake. Back row from left: Ben Washam, Harry (last name unkown), Alta Harris (wife of Ken Harris), Beverly Monroe (wife of Phil Monroe) and Chuck Jones. Front row: Rudy Larriva, Phil Monroe, Katherine (last name unknown), and Edeline Washam (Ben's wife). This is a list of the cartoons released in 1941 from Chuck Jones's Unit A: "Elmer's Pet Rabbit", "Sniffles Bells the Cat", "Joe Glow, the Firefly", "Toy Trouble", "Porky's Ant", "Porky's Prize Pony", "Inki and the Lion", "Snowtime for Comedy", "Brave Little Bat", "Saddle Silly", and "Porky's Midnight Matinee". Click here to order this class. Red Dot Auction VII Preview Night Photos + More! Wow! What an incredible couple of days! 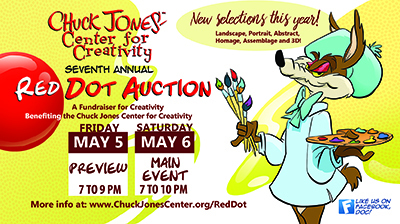 Thank you to all of our contributing artists for sharing your creativity with the Center and thank you to all of our winning bidders, donors, and sponsors who helped make the seventh annual Red Dot Auction the success it was! Bravo!All of the artists have been identified in the catalog at ChuckJonesCenter.org/RedDot. Check out who did what work! We've posted photos from the Preview Night here in the Photo Gallery. More from the Main Event to be posted in the next couple of days. Click this sentence to view the photos. Photos by Stephen Russo. I have been told on extremely good authority that there is a time to live, a time to love, a time to die, a time to etcetera -- all indisputably true, all, philosophically speaking, absolutely meaningless, but -- there certainly is always time to be surprised and delighted as I was when you called the other day. I have known courageous people, wise people, intelligent people and brilliantly talented people but seldom people who possess more than two of those qulities and I don't need more fingers than I have to count those who posess all of those qualities. You are in illustrious company, Herb Block: Mark Twain, F.D.R., Walt Kelly, R.L. 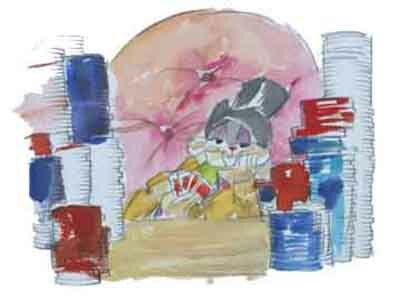 Stevenson, Vachel Lindsay, Beatrix Potter -- a few more perhaps -- shall I grow more fingers? 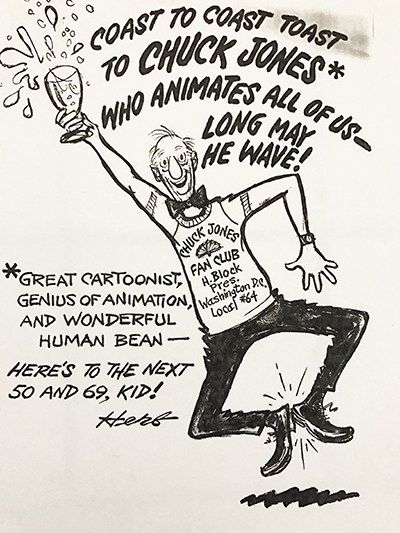 Note from Linda: At the time of this article, February 7, 1957, the lead-in stated the following: “Chuck Jones has been Art Director of the Crier from its infancy, and herein tells you how come. He and Dottie dwell in a fabulous glass-and-stone aerie up in Hollywood Knolls, and Little Linda is all grown up and married.” I was, as stated in the article, seven years old in 1944. There was no cafeteria at Valley View School in those days (is there now? ), so we all carried our lunch boxes. My lunch box was a big, black industrial size box that held wonderful surprises my mother sent each day…leftover summer squash, carrot sticks, milk (a staple), peanut butter, lettuce and mayonnaise sandwiches (which I love, still), cold lamb chop, potato chips, orange, apple, apricot, celery (with cream cheese)…and often a little note of encouragement, too… she was pretty great… Now, here is part VI… and we’ll explore something else next week. The success of the Crier has been of course due to the talent of these people, but I suspect that it could only flourish in a specialized community with a built in rapport between readers, in this case, perhaps a need for three dimensionality. What is it that drives people to the hills? Seclusion? Some hillside communities are so tightly inhabited that the roof of one house supports part of the foundation of another. The conceit of looking down on one’s neighbors? Hardly. Many hill residers’ homes crouch at the bottom of ravines, or back firmly into box canyons. Economy? The cheaper the hillside lot is, the steeper it is likely to be, and the costlier it is to prepare for building. The simple life? Floods, fires, poison oak, gophers, jackrabbits, landslides, transportation difficulties, RFD, black widows and oak blight. I return inexorably to the feeling Dottie and I have. A love of space and an acceptance of a three-dimensional world, a world in which the work and fun of climbing is equal to the joy and freedom of descending, where it is better to look up at a neighbor’s porch than flatly at your neighbor’s hedge, where a picture window makes sense because it frames a picture, where the roof-tops in the morning tell you there has been a frost, where you can look down on a bird in flight, where you can tell hillsiders from people by the fact that they read the CANYON CRIER.